SEOUL, South Korea — North Korean leader Kim Jong Un executed an army general last month in his latest purge of senior officials. General Pyon In Son, head of operations in the Korean People's Army, was killed for expressing an opinion different to that of Kim, a South Korean official told reporters in Seoul on Wednesday, speaking on condition of anonymity as per government policy. The official didn't say what they disagreed on. Kim still mistrusts the military, the official said, adding that senior officers are growing increasingly uneasy. The "Supreme Leader" also removed Ma Won Chun, a National Defense Commission official overseeing construction design, from office in November for alleged corruption and a failure to follow orders. 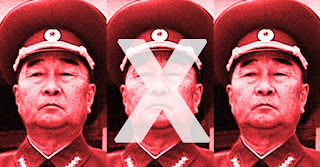 Kim has relied on purges to consolidate his grip on power since he took over a country with a nuclear arms program and 1.2 million troops in 2011. After killing his uncle and one-time deputy Jang Song Thaek in 2013, he executed about 50 officials last year on charges ranging from graft to watching South Korean soap operas. "The purge of Pyon sends a message that helps to discipline the military," said Kim Yong Hyun, a professor of North Korean studies at Dongguk University in Seoul. "The execution is a symbol that will help tighten loyalty." Pyon was promoted to a four-star general in March last year and then removed from office in November, according to the North Korea Leadership Watch blog. South Korea's Unification Ministry's website still identifies him as a general who oversees military operations. Kim's younger sister Kim Yo Jong may be married and even pregnant, the official said, saying she has a ring on her finger and has recently been seen wearing comfortable shoes in public. Yonhap News said on Jan. 2 that she married one of party secretary Choe Ryong Hae's sons, citing two unidentified people in China. The official said it's unlikely she wed Choe's son because that would concentrate too much power in Choe. Earlier Wednesday, North Korea said it wouldn't agree to talks with the U.S. and is now focused on its ability to destroy the country with conventional, nuclear and cyber-warfare attacks. Kim's regime accused the U.S. of "inching closer to the stage of igniting a war of aggression" by stepping up its sanctions, holding military drills with South Korea and predicting the future collapse of the administration, the official Korean Central News Agency said, citing a statement from the National Defense Commission. Washington (CNN) -- In the world of military strategy, every contingency must be examined, especially the worst-case scenario. Lt. Gen. Michael Flynn, the head of the Defense Intelligence Agency, made that clear when he told National Public Radio in an interview broadcast Friday how U.S. officials must plan for the possibility that Vladimir Putin's Russia has access to American battle plans and other secrets possibly taken by classified leaker Edward Snowden. "If I'm concerned about anything, I'm concerned about defense capabilities that he may have stolen from where he worked, and does that knowledge then get into the hands of our adversaries — in this case, of course, Russia," Flynn said of the former National Security Agency contractor who fled to Moscow to seek asylum. es una leccion para las fuerzas opositoras a cualquier dictadura como la firme actitud del general de brigada angel vivas y el apoyo ciudadano y de los ciberactivistas, logra que las tropas enviadas expresamente por nicolas maduro, se retiraran de los alrededores de su casa sin cumplir la orden recibida. CARACAS, 18 de febrero.- El presidente venezolano, Nicolás Maduro, destituyó hoy al general de brigada Manuel Bernal como director del Servicio Bolivariano de inteligencia Nacional (Sebin), días después de que reconociera que miembros de ese cuerpo desobedecieron la orden de acuartelarse el pasado miércoles. El jefe de Estado admitió el domingo que en la marcha que efectuaron estudiantes y opositores el pasado 12 de febrero, tras la cual se registraron hechos de violencia que dejaron tres muertos, un grupo de funcionarios del Sebin incumplieron directamente las órdenes del director del Sebin de ese día de acuartelarse y nadie salir a la calle. Las únicas Policías y funcionarios que debían estar en las calles, como estuvieron conteniendo la violencia, era la Policía Nacional y la Guardia Nacional (policía militarizada) en una segunda línea”, indicó el gobernante. Gaceta Oficial que circuló hoy, donde se señala que la decisión se basa en “el supremo compromiso y voluntad de lograr la mayor eficacia política y calidad revolucionaria en la construcción del socialismo”. Former Israeli leader Ariel Sharon has passed away at the age of 85. The former prime minister, defense minister, and general had been comatose since Jan. 2006, when he suffered a series of strokes that resulted in his permanent hospitalization. Sharon was among the last surviving members of the generation that founded, and fought for, the State of Israel in 1948. His ideological foe, President Shimon Peres, is another. For much of his career, Sharon was known as a military and political hard-liner. He was a lieutenant in the 1948 war, which began after Palestinian Arabs and surrounding Arab states attacked the fledgling Jewish state rather than accept the partition of Palestine into Jewish and Arab countries. Sharon was seriously wounded at the Battle of Latrun--one of the Arab forces' few victories, thanks to Jordan's British-trained Arab Legion. Following the armistice, Sharon led an elite Israeli guerrilla unit that conducted cross-border reprisals and raids to deter Palestinian fedayeen from carrying out terror attacks inside Israel. His aggressive tactics drew criticism from fellow Israeli leaders--and cultivated a fearsome reputation in the Arab world. He continued to cause controversy with his preference for offensive rather than defensive tactics in Israel's subsequent wars. Sharon's vindication, both militarily and politically, came in the Yom Kippur War, when Israeli forces were taken by surprise by Egyptian and Syrian forces attacking on the holiest day of the Jewish calendar across the Suez Canal and in the Golan Heights, respectively. Israel's defensive strategy against Egypt had depended on a string of lightly-guarded forts along the canal, almost all of which fell within hours of the Egyptian assault. As Israel's military leadership shuddered, and Prime Minister Golda Meir scrambled to secure U.S. arms, Sharon emerged from retirement to lead troops in the Sinai. He led a daring crossing of the Suez Canal, eventually penetrating behind Egyptian lines, encircling Egypt's entire Third Army and destroying the Soviet-made surface-to-air missiles (SAMs) that had kept the overwhelming power of the Israel Air Force in check. Soldiers hailed Sharon as a hero, and his performance--amplified by the fact that he had suffered a head wound during the war and kept fighting regradless--boosted his political ambitions within Israel's conservative Likud Party, which came to power in 1977 after 29 years of dominance by the left-wing Labor Party. Sharon served the government of Menachem Begin, first as Minister of Agriculture and then as Minister of Defense. It was in the latter capacity that Sharon showed signs of being willing to make difficult sacrifices for peace. After Begin signed the Camp David Accords with Egypt, guaranteeing a return of the Sinai desert (captured in 1967) in exchange for peace and normalization of relations, Sharon took up the task of evacuating the settlement of Yamit, which Israel had established in the Sinai in anticipation of building a deep-water port. Soon thereafter, Sharon also suffered his greatest political setback. When Palestinian guerrillas made life in the north of Israel difficult through repeated shelling and terror attacks, Israel responded by invading and ousting the Palestinian guerrilla strongholds in southern Lebanon. Yet Sharon, who had initially only sought approval for a limited invasion, soon led Israeli forces all the way to the capital city of Beirut itself. One of the Christian militias with which Israel had aligned itself then conducted massacres in the Palestinian refugee camps of Sabra and Shatilla, in retaliation for the assassination of the Lebanese president. Israeli forces provided cover for the militia until they finally intervened to stop the killing. A subsequent inquiry by Israel's Kahan commission found Sharon had failed to prevent the massacres, and he was forced to resign. Sharon gradually found his way back to the political forefront as a critic of the Oslo peace accords, which were signed in 1993 after secret talks between the Israeli government and Yasser Arafat's Palestine Liberation Organization. Under the agreement, Israeli forces withdrew from Palestinian cities in the West Bank and Gaza, two territories taken by Israel in the Six-Day War of 1967. Yet Palestinian terror continued--and accelerated. By 2000, after Prime Minister Ehud Barak had withdrawn the last Israeli soldiers from southern Lebanon and offered Arafat generous concessions in exchange for peace, Sharon emerged as the leader of the opposition. After Arafat rejected Barak's terms at the Camp David peace conference in July 2000, Palestinians began plans for a renewed intifada--one far more violent than the popular protest that had erupted in late 1987. Palestinians used Sharon's controversial visit to the Temple Mount in Jerusalem--which falls under Israeli sovereignty, but remains a Muslim prayer site, despite its connection to the Jewish faith--as the pretext to launch the second intifada, which included brutal terror attacks and live exchanges between Palestinian police and Israeli forces. A disillusioned Israeli public elected Sharon to lead the government in January 2001. Over the next several years, Sharon succeeded in defeating Palestinian terror through deft counter-insurgency warfare and the construction of a sophisticated barrier (mostly a fence, though a wall in some sections) along and partly within the West Bank. In the process, he resisted intense international pressure and criticism, including false accusations of a "massacre" in the Palestinian city of Jenin, among other exaggerated claims. Sharon gradually dismantled much of the government of Palestinian Authority chairman Arafat--physically, as well as politically. Arafat, whom Sharon considered a "murderer," won the support of U.S. President George W. Bush for a Palestinian state, a gesture Sharon openly compared to the appeasement of Munich. The Bush administration scaled back its Palestinian outreach after Arafat was caught smuggling weapons from Iran. Aside from that disagreement, Bush and Sharon worked together well, especially as the U.S. confronted new terror threats of its own. After Arafat's death in 2004, Sharon indicated that he was more willing to work with his successor, Mahmoud Abbas, who was elected to lead the Palestinian Authority in January 2005. Peace talks continued, often under U.S. pressure, but did not advance significantly towards a final agreement. It was then that Sharon carried out the most dramatic--and fateful--policy of his political career: the Gaza "disengagement," a unilateral withdrawal of soldiers and settlers from Gaza. Ironically, Sharon had campaigned for re-election against such a withdrawal, which had been the policy of his Labor Party opponent. Yet Sharon saw an opportunity to relieve the cost of occupation, and boost Israel's diplomatic position. After several members of his own party resigned in protest, Sharon formed a new government, and eventually a new party, Kadima ("Forward") to support the withdrawal. In August 2005, Israeli soldiers evacuated the remaining settlers from Gaza, amidst tearful scenes of civil disobedience. Sharon's reward was official U.S. recognition of some Israeli territorial claims in the West Bank, and worldwide acclaim for his statesmanship. In private conversations, Sharon stressed that he had decided on the disengagement policy because he believed it would be best for the long-term security of Israel and the Jewish people. Palestinian terror groups, however, had other ideas, destroying the infrastructure the settlers had left behind and accelerating rocket attacks against Israeli civilians in the towns and communities near the border--including Sharon's own farm. In late 2005, on the eve of new Israeli elections, and in the midst of official investigations into a loan Sharon had received during his previous campaign, Sharon suffered a mild stroke. He suffered a far more serious one in January 2006. His most fanatical critics on the Israeli right, who had once seen him as a savior, called his illness divine retribution. His successor, Ehud Olmert, faced two wars from newly-emboldened terror groups. Sharon, who is survived by two sons and their children, suffered many personal tragedies. His first wife died in a car accident, his second wife died of cancer, and a third son was accidentally shot by a friend. His legacy will remain controversial. He is remembered as a killer, traitor, and hero. At the core, he was a man obsessed with the security of the Jewish people--and he was willing to confront them, if necessary, to achieve it. Young North Korean leader Kim Jong Un's previously powerful uncle has been executed as a traitor, the country's state-run news service said Thursday. 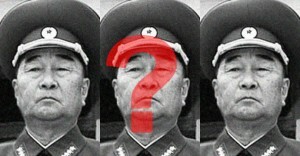 According to KCNA, the uncle, Jang Song Thaek, was guilty of "attempting to overthrow the state." On Monday, the isolated regime announced that Jang had been dismissed from his vaunted official post for a string of criminal acts, including corruption, womanizing and drug-taking. "All the crimes committed by the accused were proved in the course of hearing and were admitted by him," KCNA stated on Thursday — in a report that claimed that "people throughout the country broke in to angry shouts" when they heard of Jang's alleged crimes. The over-the-top report goes on to call Jang "despicable human scum." South Korea's spy agency last week said it believed Jang, long regarded as the second most powerful man in the secretive state, had been relieved of his posts in November. The moves indicate Pyongyang is undergoing its biggest leadership upheaval since the death in 2011 of former leader Kim Jong Il, the younger Kim's father. Tensions are still high on the Korean Peninsula following a torrent of threats in March and April by Kim Jong Un's government against Washington, Seoul and Tokyo, including vows of missile and nuclear strikes and warnings that Pyongyang would restart nuclear bomb fuel production. Jang was married to Kim Jong Un's aunt, Kim Kyong Hui, the younger sister of Kim Jong Il. North Korean leader Kim Jong Un's uncle Jang Song Thaek, center, is arrested during an enlarged meeting of the Political Bureau of the Central Committee of the Workers' Party in Pyongyang on Sunday. 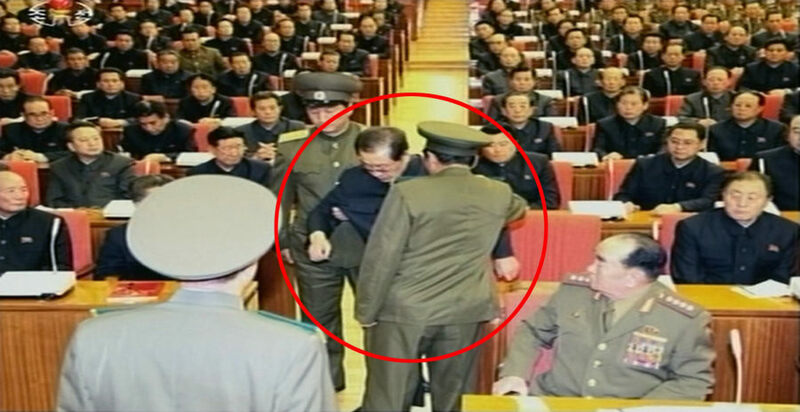 Jang Song Thaek was taken from his chair by two police officials. This is the dramatic moment showing the once-powerful uncle of North Korean leader Kim Jong Un being hauled away by police from a political meeting. The stunning purge of Jang Song Thaek, 67, once considered the force behind the young leader, delivered a chilling message: No one is beyond Kim's reach, not even family. North Korean state-run news agency KCNA announced Monday that he had “led a dissolute and depraved life” and said he had been dismissed for a string of criminal acts including corruption, womanizing and drug-taking. "Jang and his followers committed criminal acts baffling imagination and they did tremendous harm to our party and revolution," the agency said in a report following a meeting of the ruling Workers' Party politburo on Sunday. Kim Jong Un attended and "guided" the meeting which decided to dismiss Jang from all his posts and expel him from the Workers' Party, KCNA said. "Affected by the capitalist way of living, Jang committed irregularities and corruption and led a dissolute and depraved life," the news agency added, saying the decision to remove him was also based on his mismanagement of the country's financial system and corruption. "Jang pretended to uphold the party and leader but was engrossed in such factional acts (such) as dreaming different dreams and involving himself in double-dealing behind the scenes," KCNA said. To the surprise of many, Jang Song-thaek, who has been regarded as the second most influential man in North Korea since state leader Kim Jong-un took power, has reportedly been knocked out of multiple high-ranking positions. Seoul's National Intelligence Service made an emergency report to the National Assembly Tuesday afternoon, saying that Jang had been overthrown, and two of his close confidants executed. "Jang Song-taek's two aides Ri Yong-ha and Jang Su-gil were executed publicly in late November." The two are said to have been executed on charges of plotting anti-communist party schemes against the Kim Jong-un regime. The last revolutionary from mankind's bloodiest century died Friday at a military hospital in Vietnam's capital of Hanoi. A former journalist with no formal military training, General Vo Nguyen Giap defeated the French at Dien Ben Phu in 1954 and later America's South Vietnamese allies in 1975. The decades-long war for independence was one of the bloodiest and hardest fought by all combatants. "No other wars for national liberation were as fierce or casued as many loses as this war," said Giap in 2005. Phu, Giap used women and children to drag field guns over steep mountain passages and began a bloody 54-day siege. Giap's reputation for ruthlessness was sealed by Dien Ben Phu; of the 10,000 French troops that began the siege, less than 900 made it home to France. Roughly 20 years later, General Giap defeated a demoralized and disorganized South Vietnamese Army after the U.S. Congress cut off much-needed material. At the height of the war in the late 1960s, over 500,000 American troops were engaged in combat. The American casualties were staggering, with 58,286 KIA's, 153,000 wounded, and 1,645 MIAs. After the fall of Saigon to Giap's Army of the North, the death toll reached unprecedented levels with millions being executed, starved, or worked to death in "re-education" camps. Giap's tenacity and ruthlessness became his trademarks as he fought two of the world's most technlogically advanced militaries. "At the end, it was the human factor that determined victory," said General Giap. Reports of a suspected shakeup in North Korea’s military leadership were confirmed Monday by state media reports detailing a recent visit by Kim Jong Un to front-line Korean People’s Army units near the disputed Northern Limit Line (NLL). During a Monday inspection of front-line units on the Jangjae and Mu Islets – the location from which artillery units launched the 2010 Yeonpyeong Island shelling –Kim Jong Un was accompanied by Jang Jong Nam and Ri Yong Gil, two recently promoted four-star generals that sat in place of former Chief of KPA General Staff Kyok Sik recent soccer match in Pyongyang. Significantly, in the KCNA report of Kim Jong Un’s visit to the NLL, General Ri Yong Gil was listed as Chief of the Korean People’s Army General Staff, a position held by General Kim Kyok Sik until just over a week ago. On Friday NK News reported on General Kim’s apparent disappearance from the public spotlight, a trend that had been increasingly noticeable since his last appearance in early August. Kim’s disappearance followed an official visit he made to Cuba in early July, just weeks before Panama intercepted a Cuban arms shipment en-route to North Korea. British North Korea expert Aidan Foster-Carter told NK News that Kim may have lost his job as a result of the affair. “Kim Kyok Sik has not been seen since Aug 3, nearly a month. Yes, that suggests he has been sacked. He went to Cuba of course: maybe he was punished for the Panama fiasco?” he said. “In Pyongyang, the price of failure is high – or even grim,” Foster-Carter added. 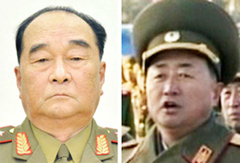 Kim Kyong Sik replaced Kim Jong Gak as the as the Minister of the People’s Armed Forces in November. Widely believed to be the military hardliner responsible for the 2010 shelling of Yeonpyeong, Kim’s short tenure reflects an emerging trend of high-profile military reshuffles following Kim Jong Un’s succession to power. North Korea's hawkish military leader Gen. Kim Kyok-sik has been fired only six months after he was appointed to the post. The official KCNA news agency on Monday introduced Jang Jong-nam as the new minister of the People's Armed Forces. Jang was among senior officials alongside leader Kim Jong-un who watched a performance by a song-and-dance ensemble of the Internal Security Forces, KCNA said. As recently as May 3, it was Kim Kyok-sik who accompanied Kim Jong-un. It is unclear whether Kim Kyok-sik took the fall for the recent months of unsuccessful saber-rattling that only prompted the North's sole ally China to tighten sanctions. "We'll have to wait and see whether it was a demotion or just a replacement," a security official in South Korea said. "If he'd made a minor mistake, Kim Kyok-sik would have kept his post but been demoted in rank, so he must have made a pretty big mistake." Kim Kyok-sik was the commander of the infamous Fourth Army Corps that controls the area around the Northern Limit Line. There his troops provoked a naval skirmish near Daecheong Island in November 2009, sank the South Korean Navy corvette Cheonan in March 2010 and shelled Yeonpyeong Island in November the same year. After the shelling of Yeonpyeong Island, Kim was reprimanded by the Politburo for failing to respond properly to the South Korean counterstrike. But he popped back up as armed forces minister in November last year. Nothing is known about his successor Jang except that he had been the commander of the First Army Corps, which controls the frontline area in Kangwon Province, and that he is in his 50s. Kim's ouster means that all three top North Korean military posts, the chief of the Army's General Staff, the chief of the General Political Bureau, and the minister of the People's Armed Forces, have gone to a slightly younger generation in their 50s and 60s. Some believe new leader Kim Jong-un is purging the powerful military of superannuated hawks associated with his father's "military-first" regime. "Unlike his father who let senior military leaders stay in their posts until they grew old and died, Kim Jong-un has wrought generational shift in key posts since he took power," the South Korean security official added. "Maybe he's trying to get out of his father's shadow." muerto el perro se acabo la rabia, o no? 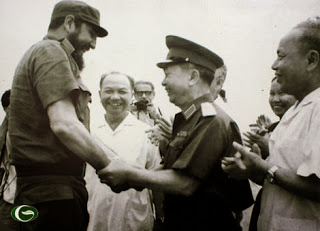 MIAMI, Florida, 30 de agosto, 2013, redacción, www.cubanet.org – La visita a Cuba del general Kim Kyok Sik, semanas antes de que Panamá interceptara un embarque de armas cubanas en ruta a Corea del Norte, puede haber provocado que el general fuera relevado y desaparecido, cuestiona el informativo NK –News. Kim Kyok Sik –según NK–, que ocupaba el cargo de Jefe del Ejército Popular de Corea, no ha sido visto en público desde principios de agosto. Tampoco apareció junto al máximo líder Kim Jong Un, en un partido de fútbol el pasado miércoles. “Kim Kyok Sik no ha sido visto desde el 3 de agosto, casi un mes. Tal vez fue castigado por el fiasco de Panamá”, asegura Aidan Foster Carter, observador de Corea de Corea del Norte para Noticias NK. “La reciente visita del general Kim a La Habana pudo haber sido para sellar el acuerdo del envío de armas que acabó en un vergüenza para los dos países. En Pyongyang, el precio del fracaso es alto –o incluso sombrío–, agregó Foster-Carter. Aparentemente Kim ha sido sustituido por dos generales de cuatro estrellas, Ri Yong Gil y Jang Jong Nam. Imágenes publicadas por medios surcoreanos mostraron que ambos generales llevaban cuatro estrellas en sus uniformes militares, en lugar de los tres que ostentaban anteriormente. Ri, quien ocupa el cargo de Jefe del Departamento de Operaciones – bajo las órdenes de Kim Kyok Sik — aparece en las notas de la prensa estatal en el lugar que habitualmente ocupaba Kim. Y los medios norcoreanos suelen ser muy cuidadosos al catalogar a los oficiales de élite, en orden y rango de importancia. En las últimas fotos, Jong Nam, ascendido en mayo, se muestra junto a Ri. “Kim parece haber caído solo –siguiendo a otras figuras desaparecidas desde que Kim Jong ocupó el liderazgo del país. Los cuatro altos mandos, que estuvieron junto al féretro de Kim Jong Il, ahora están fuera del juego en Norcorea “, explicó Aidan Foster- Carter. En el otro país implicado en el escándalo del canal de Panamá, en Cuba, el general Pedro Mendiondo, quien atendió la visita a la Isla, de Kim Kyok Sik, falleció el pasado domingo en un accidente de tránsito, ocurrido en momentos en que inspectores de Naciones Unidas solicitaron viajar a la Isla como parte de la investigación que conducen en relación con las armas de defensa coheteril y aviones cubanos ocultos en el barco norcoreano. 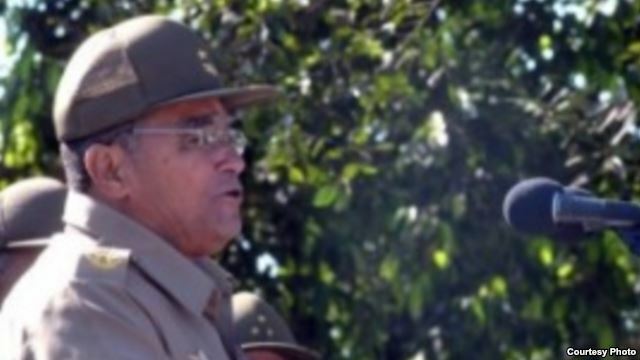 Esas armas, denunciadas por organizaciones suecas como “no todas obsoletas”, estaban bajo la jurisdicción de Mendiondo, en su calidad de Jefe de la Fuerza Aérea y Defensa Antiaérea de Cuba. 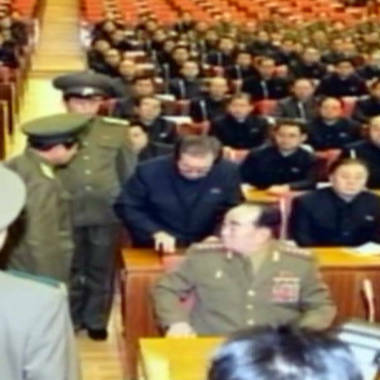 Gen. Kim Kyok Sik, right, stands with then-North Korean leader Kim Jong Il on April 23, 2007. He was reportedly replaced by little-known army General Jang Jong Nam on Monday. SEOUL, South Korea -- North Korea has replaced its hard-line defense chief with a little-known army general, according to a state media report Monday, in what outside analysts call an attempt to install a younger figure meant to solidify leader Kim Jong Un's grip on the powerful military. Jang Jong Nam's appointment is the latest move since Kim succeeded his late father in late 2011 that observers see as a young leader trying to consolidate control. The announcement comes amid easing animosities after weeks of warlike threats between the rivals, including North Korean vows of nuclear strikes. Pyongyang's rhetorical outbursts against massive U.S.-South Korean war drills and U.N. sanctions over the North's February nuclear test were seen, in part, as a push to portray Kim Jong Un at home as a respected military commander on the world stage. Jang's new role as minister of the People's Armed Forces, however, isn't thought to indicate a potential softening of Pyongyang's stance toward Seoul and Washington any time soon, analysts said. Jang replaces Kim Kyok Sik, the former commander of battalions believed responsible for attacks on South Korea in 2010 that killed 50 South Koreans. Outsiders don't know much about Jang, but analysts said it's unlikely that Kim Jong Un would name a moderate to the post at a time of tension with the outside world. Mention of Jang's new role was buried in a state media dispatch listing those who attended an art performance with Kim Jong Un. It's not known exactly when Jang was formally appointed to the ministerial post. The announcement coincided with the beginning Monday of U.S.-South Korean naval exercises involving a nuclear-powered U.S. aircraft carrier. North Korea has criticized the carrier's inclusion in the drills, which it claims are preparations for an invasion of the North. Also, when tensions peaked in March, Washington took the unusual step of announcing that nuclear-capable B-52 and B-2 bombers had participated in the earlier, larger-scale joint drills between the allies. North Korea regularly cites the powerful U.S. nuclear arsenal and Washington's deployment of those assets in the region as justification for its own pursuit of nuclear weapons. One of the most notable changes from Kim Jong Un was the replacement of the powerful military chief, Ri Yong Ho, who was dismissed because of what Pyongyang called an unspecified illness. Outside observers speculated that Ri, who held a different post than the one Jang has been appointed to, was purged as Kim tried to put his stamp on his government. Ri was also replaced by a little-known general. State media previously identified Jang as head of the army's First Corps and said he pledged allegiance to Kim Jong Un and threatened South Korea in a speech last December. Jang was quoted as saying that his corps would annihilate its enemies and "turn each ravine into their death pitfall when the hour of decisive battle comes." Kim Jong Un appears to be naming someone from a new generation to bolster his rule of the 1.2 million-member military, said Chang Yong Seok at the Institute for Peace and Unification Studies at Seoul National University. Jang is believed to be in 50s, while his predecessor, Kim Kyok Sik, is in his early 70s, according to Seoul's Unification Ministry, which is responsible for dealings with the North. 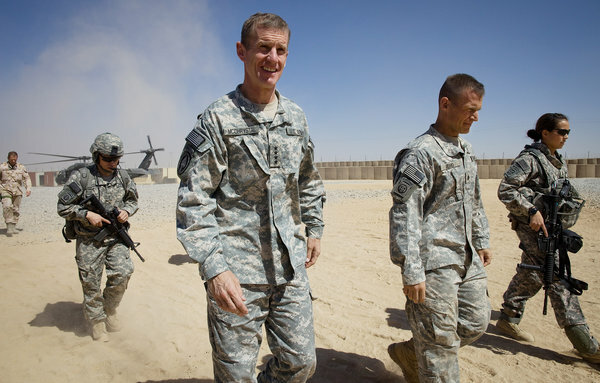 General Stanley A. McChrystal arriving for a meeting with high-ranking military personnel near Kandahar, Afghanistan, in 2009. WASHINGTON — In a memoir, Gen. Stanley A. McChrystal, the former American commander in Afghanistan, writes that tensions between the White House and the Pentagon were evident in the Obama administration from its opening months in office. The book by General McChrystal, who was fired from his post in 2010 after an article in Rolling Stone quoted him and his staff making dismissive comments about the White House, is likely to disappoint readers who are looking for a vivid blow-by-blow account of infighting within the administration. The book, titled “My Share of the Task: A Memoir,” does not provide an account of the White House meeting at which Mr. Obama accepted the general’s resignation. General McChrystal’s tone toward Mr. Obama is respectful, and he notes that his wife, Annie, joined the crowd at Mr. Obama’s inauguration. The book is to be released on Monday. An advance copy of the book provides revealing glimpses of the friction over military planning and comes as Mr. Obama is weighing, and perhaps preparing to overrule, the troop requests that have been presented by the current American commander in Afghanistan, Gen. John R. Allen. The account is all the more noteworthy since General McChrystal, who retired from the Army, remains a respected voice within the military and teaches a course on leadership at Yale. According to the book, the tensions began before General McChrystal took command in Kabul, Afghanistan, and were set off by a request from his predecessor, General David D. McKiernan, for 30,000 additional troops at the end of the Bush administration. Instead of approving the entire request, in February 2009, Mr. Obama decided that 17,000 would be sent, adding that decisions on additional deployments would be based on further analysis. From the White House perspective, General McChrystal writes, “this partial decision was logical.” After less than a month, the president had increased American forces in Afghanistan by 50 percent. Though Mr. Obama had cast the conflict in Afghanistan as a “war of necessity,” as a candidate he was nonetheless wary about a prolonged American military involvement there. But the Pentagon pressed for an additional 4,000 troops, fearing that there was little time to reverse the Taliban’s gains before the August elections in Afghanistan. “The military felt a sense of urgency, seeing little remaining time if any forces approved were to reach Afghanistan in time to improve security in advance of the elections,” he wrote. The White House later approved the 4,000 troops, but the dispute pointed to a deeper clash of cultures over the use of force that continued after General McChrystal took command. “Military leaders, many of whom were students of counterinsurgency, recognized the dangers of an incremental escalation, and the historical lesson that ‘trailing’ an insurgency typically condemned counterinsurgents to failure,” he writes. In May 2009, soon before he assumed command in Kabul, General McChrystal had a “short, but cordial” meeting with Mr. Obama at which the president “offered no specific guidance,” he notes. The next month, General McChrystal was surprised when James L. Jones, Mr. Obama’s first national security adviser, told him that the Obama administration would not consider sending more forces until the effect of arriving units could be fully evaluated. That contradicted the guidance that General McChrystal had received from Defense Secretary Robert M. Gates that he should submit an assessment in August of the additional forces that might be required, he writes. That prompted a challenge by a Washington-based official, whom General McChrystal does not name, that the goal of defeating the Taliban seemed too ambitious and that the command in Kabul should settle instead for an effort to “degrade” the Taliban. At the next video conference, General McChrystal presented a slide showing that his objectives had been derived from Mr. Obama’s own speeches and a White House strategy review. “But it was clear to me that the mission itself was now on the table for review and adjustment,” he wrote. After General McChrystal determined that at least 40,000 additional forces were needed to reverse the deteriorating situation in Afghanistan, Mr. Obama provided 30,000 and said he would ask allied nations to contribute the rest. General McChrystal acknowledges that he had concerns that Mr. Obama’s decision to announce a date for beginning the withdrawal of the additional “surge” forces might embolden the Taliban. But the general writes that he did not challenge the decision. “If I felt like the decision to set a withdrawal date would have been fatal to the success of our mission, I’d have said so,” he writes. General McChrystal has little to say about the episode that led to the article in Rolling Stone. He writes that the comments attributed to his team were “unacceptable” but adds that he was surprised by the tone of the article, which he had expected would show the camaraderie among the American, British, French and Afghan officers. As the controversy over the article grew, General McChrystal did not seek advice before offering his resignation. The book does not say if he was disappointed when Mr. Obama accepted it at a brief White House meeting. Will Petraeus Set the Record Straight? Breitbart quotes a tweet by CNN correspondent Frances Townsend claiming information by Pentagon correspondent Barbara Starr that David Petraeus will testify that he knew the attack on the Benghazi consulate was terrorism “almost immediately.” The “same source” claims he will say Susan Rice’s talking points ascribing the attack to a video came from the White House. If Petraeus really does testify to this effect, he will inescapably be alleging under oath that the president was a liar. Even if the testimony is restricted strictly to Benghazi and not its aftermath, the crucial question remains: did the president abandon the men on the ground to their fates? Of course the purpose of this new leak may be to muddy the waters. In Washington, home to hundreds of newspaper correspondents and reporters, nothing is as it seems. The age of Obama resembles nothing so much as an evil fun-house of mirrors. There may be a behind-the-scenes effort to influence what Petraeus will say. Charles Krauthammer has already suggested that the administration has tried to use the Broadwell incident to silence the former CIA director. But if Petraeus testifies as advertised, it may mean that he has decided that the administration will destroy him even if tries to go along and that his only remaining option is to fight. DP’s options are rapidly shrinking. CNN reports that the CIA has opened an internal investigation into Petraeus’ conduct. Does anybody still believe this is about an extra-marital affair? Probably the same people who who believed that Benghazi was about a YouTube video. Former CIA Director David Petraeus told an HLN journalist he never passed classified information to Paula Broadwell and insisted his resignation last week had nothing to do with the Sept. 11 attack that killed four Americans in Benghazi, Libya. Petraeus has been speaking with HLN’s Kyra Phillips since last week. Phillips relayed some of their conversations on the air on Thursday. Phillips said Petraeus told her he wants to testify about Benghazi — something he will do behind closed doors on Friday.